The two-time Super Bowl champion was previously benched for the New York Giants. TWO-TIME SUPER Bowl champion quarterback Eli Manning will be back under center for the New York Giants on Sunday. Interim coach Steve Spagnuolo said it was a “gut” feeling to return Manning to his starting role, one week after he was benched by head coach Ben McAdoo. The move led to an uproar that ended with McAdoo being shown the door on Monday. Giants general manager Jerry Reese was also dismissed after an 11-year reign that yielded two Super Bowls. “Eli Manning will be the quarterback for this football team in this game,” Spagnuolo said in comments looking ahead to Sunday’s game against the Dallas Cowboys. Manning, whose streak of 210 consecutive starts ended when McAdoo benched him in favor of backup Geno Smith, was looking forward to getting back on the field. The QB shakeup didn’t help the Giants, who fell to 2-10 with a 24-17 loss to Oakland last weekend. 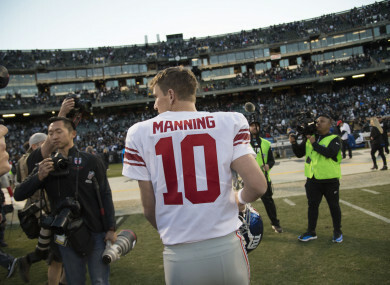 A week after McAdoo’s ill-fated move sparked speculation that the Giants’ “Manning Era” could be over, the 36-year-old quarterback said he was eager to restore the struggling club to contender status. Email “Normal service resumes! Eli Manning returns as starting quarterback”. Feedback on “Normal service resumes! Eli Manning returns as starting quarterback”.